This page will include everything north of Patagonia in Argentina. For the Patagonian region, click here. The border and buildings before the tunnel are for people coming into Chile. Simply drive by the booth where you will be stopped and given a ticket with how many people are in your vehicle written on it. Just after the view point for Aconconagua take a left into the obvious immigration/customs area. Buses and very tall vehicles will be lined up in the right most lane, go around them. You’ll drive into the building in the left lane. Each kiosk you stop at has two people in it, one person from each country in it. It’s very easy and straight forward. Kiosk 1: Stamp out of Chile and into Argentina. You’ll need passport, tourist card from Chile, new tourist card for Argentina (can be filled out in advance if you’re waiting in the line of cars), Chilean vehicle permit, and printed proof of payment for visa/reciprocity fee (purchased in advance if you’re from the US/Canada/Australia), and ticket from Chilean side with number of people in vehicle. They will stamp your ticket and you will need it later in Argentina, don’t lose it. We were not asked to show proof of insurance. Kiosk 2: Turn in your Chilean vehicle permit. Argentinian person will issue you a new one. You’ll need driver passport, title/registration. No copies necessary. Kiosk 3: Searching/Fumigation. They asked us if we had any fruits/vegies. We told them all we had was one onion; they didn’t take it, search us, or do any kind of fumigation. Exit building and get back on the highway. After you pass the Puente de Inca there will be a person at a checkpoint who will check your papers and take your stamped ticket. Bring the money with you before entering Argentina. While you can get US dollars in Peru, Bolivia, and Chile for instance, you will not be able to in Argentina. Bring unmarked, crispy, new 100 dollar bills for the best rates. Try to find a reputable changer. Ask around, everyone knows where the best place to go is. The more you change at once the better rate you will get. Don’t change too much though, it’s hard to change back when you leave! Look up the current rate before you go to change, it’s constantly fluctuating. Many websites list it. Just google Dollar Blue. Read a quick tutorial on how to spot counterfeit bills. We didn’t have any issues and visited numerous changers, but knowing how to check the bills certainly eases the mind. Eat as much meat as you can! Grocery stores and carnecerias sell incredibly good cuts of meat for insanely good prices. We lived off fillet mignon practically our entire stay! Look up your cuts online. Bife and lomo, for instance, are good bets! Drink lots of wine! It’s great and cheap! Everything really closes down for siesta, especially in the not so touristy places and bigger cities. Be prepared to eat a dinner out quite late in the evening. Things get rolling around 10p! This page will include info for both southern Chile and Argentina. 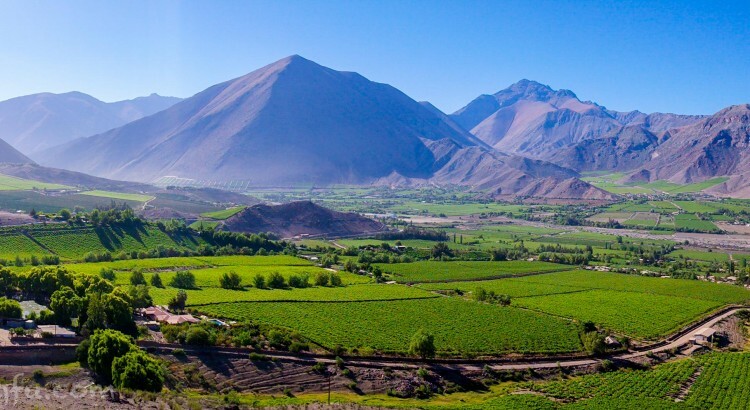 Click here for information on northern Chile and here for information on northern Argentina. Pull up to unmarked green building. Stamp out at migracion. They will look at car permit and take your tourist card. At Aduana hand over permit. At migracion stamp in, give registration or title for them to look over, fill out tourist card, and get paper that they will stamp. Adauna next. If you are already in their system like we were, they will look at the registration but will already have info in the computer and print out a new permit. Go to SAG for declaration. Remember to put yes if you have any milk, meat, fruit, vegetables, or eggs. If you don’t do this they can fine you if they find these items in your car. Give them the ticket with stamps. Park after the hosteria. Migracion first to stamp out, show permit to them and give over tourist cards. Adauna next, hand over permit. Migracion: need reciprocity paper if from US. Stamp in, no need for tourist card here. Aduana: give driver passport and registration. They issue a new permit. Quick search of car for fruits and vegetables by personnel. Not only is it a long way between gas stations, but some of them don’t have gas all the time, and others might limit how much fuel they will give you. Never pass up a chance to get gas! Most of Route 40 in Argentinas side of Patagonia is paved now. We had a very current paper map and of the several hundreds and hundreds of kilometers of dirt it showed, only 100-200 of it was dirt and it was nearly finished being paved as well. A tailwind will make you feel like you don’t need gas at all! A headwind will have you wondering if you’ll even make it to the next gas station! Gas on the Argentinian side of Patagonia is way cheaper then the rest of Argentina or Chile. There is a quicker and more laid back border just north of Rio Turbio if you’re heading from Calafate to Torres del Paine (or vice versa) but the be advised there is no ATM and often no gas. For us this meant driving to Puerto Natales regardless of which border we took simply to get Chilean pesos for Torres del Paine. The fairy from Punta Arenas runs twice a day. It was approximately $40 US for two people and our van. Might be a good idea to make a reservation the day before in the busy season. We heard the other ferry on the 257 further north is cheaper and runs all day. Remember that time we drove through a crazy remote border from Ecuador into Peru and thought it was pretty wild… well… ummm… meet Bolivia. Hundreds and hundreds of miles of horrible, corrugated, dirt tracks at ridiculously high elevations with no services, gas, or help in any direction for days and days… sounds like the perfect adventure for the Craggin’ Wagon! What could go wrong? This page will include everything north of Patagonia in Chile. For the Patagonian region, click here. Don’t forget to stop at the remote Aduanas office inside the Park at the Boric acid plant to hand over your vehicle papers!!! Stamp out. New requirement at this border is a Bs fee of 15-20 pp for maintenance of the border. Go to immigration, fill out tourist card. They will enter info into computer and hand passports and copy of tourist card. Go to aduana’s. Give registration and driver’s passport (they will not need copies). They will give you a vehicle permit. Across the street is the declaration building. Need to fill out forms declaring stuff. If you have any eggs, milk, cheese, vegetables, you need to say yes on form. They will search your car and if you said no, it is a $200 US fee if you have anything that you did not declare. Be careful entering Chile. They will hijack you for your food at every border! Sometimes they take your cheese and vegetables, other times they’ll take your meat and dairy. The best thing to do if you’re like us and carry a lot of food with you is to stop before the border and hide it. Do this at your own discretion though – if you were to get caught they claim there is a $200 fine. We hid our food in a backpack way under the bed and left a few things in the fridge on purpose, claimed them on the form, and let them confiscate it. Worked fine. Copec truck stops/gas stations are excellent places to camp free if you’re on a major highway. They have bathrooms, showers, security, free wifi, and sinks for water and dishes. We were randomly pulled over and had our van searched by drug dogs, this would be a bad country to drive around in with anything. The limit for drinking and driving is so low in Chile that you essentially cannot even have one drink. There are a lot of campgrounds in Chile’s cities, but they’re expensive. We found stealth camping or camping at Copec stations saved us a great deal of money. Gas is also really expensive. Yungay is the easier, more relaxed, more scenic border crossing from Peru into Bolivia. Both towns are on Lake Titicaca and shouldn’t be missed! Drive up to the chain across the road and park. Go to the police office just to the right of immigration. An official will stamp your card. Go to immigration building for stamp and they will keep the tourist card. Go to white aduana building across the street and hand over permit. Park before gate after arch. Fill out 2 forms of paper work at immigration. Need a passport and a copy, completed tourist card, and completed visa form, and $135 (for Americans). They scanned our passports and we did not need passport photos. Official will place visa sticker and stamp. Aduana’s (left of immigration) needs original and copy of: passport, registration/title to issue a permit. When leaving Copacabana a police officer will stop you and write information in a ledger, stamp permit, and charge Bs 20 for a piaje. Gassing up is tricky if you’re not from Bolivia. The international price is about triple what locals pay. Tell the attendant you don’t need a receipt and negotiate for a price between 5 – 7 Bolivianos per liter. We gassed up at 5 once, 6 twice, and 7 twice. Like anything in Latin America, the better your Spanish is and the more you argue the better you’ll do. Tell them that you paid 5 here yesterday and that your friends did as well. Also, hit the smaller stations on the outskirts when possible – they’re much more likely to sell to you if there’s fewer attendants, no bosses around, and fewer other patrons. The roads are rough on vehicles. Take your time on the wash board to save your suspension and not rattle your rig apart. Bolivia is in the process of constructing a nice, modern paved highway between Oruro and Uyuni. It is not complete and the road through is currently littered with detours and construction. If you’re not heading to Potosi or Sucre it’s doable. Careful if it rains, the entire thing becomes a mud slog. Don’t hand over original documents to the cops if you can avoid it. Use copies, especially of your license – the first cop we gave my license to wanted 200B to give it back. We eventually got it back and told him he could have 20B or nothing and were on our way. More arguing and demanding an official ticket would have eventually prevailed we think, but for less than 3 dollars US we preferred to just be on our way. Enjoy your time at the Oberland Hotel if you camp there, it’s the last good wifi for the country and the llama steaks in the restaraunt are excellent! 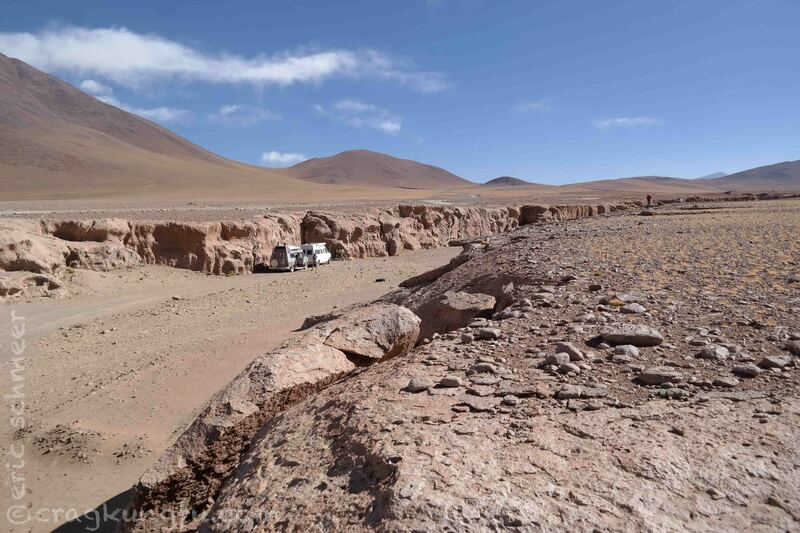 The main entrance to Salar (north of Uyuni about 12-16k) had several deep sections of brine and water. We had to pick and choose which spots to drive through versus around. We pretty much skirted the main water by driving around the whole mess on the right. If you’re unsure, wait for a land cruiser or two to come by with tourists and watch them. Great way to judge where to go and not to go. After that, it’s easy and perfect. 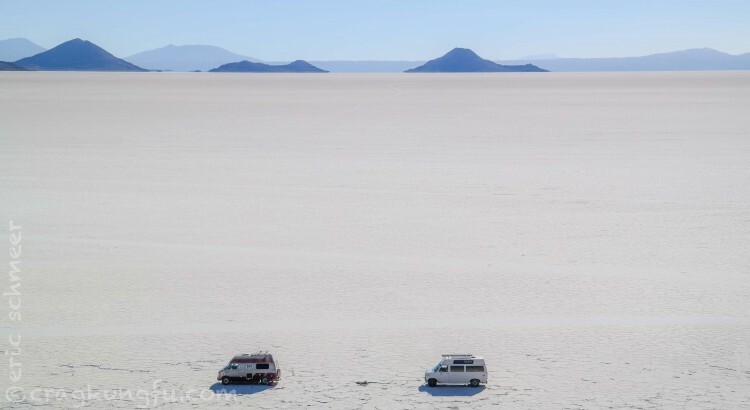 The touristy Isla Incahuasi might be worth driving by or stopping at for a beer, but if you’re camping on the Salar and have your own rig you’ll want to head to the awesome Isla Pescado. We paid 50 Bolivianos at the very last building on the Southwest corner of town (near the gas station) for a car wash and fumigation (light coating of used motor oil on the undercarriage). Don’t skip this step when you’re done with the Salar. Salt is no bueno for your rig. The gas station on the Eastern side of town gave us the best price (6B) despite it being the busiest and the boss hanging around. We did this in our old van without 4X4. San Cristobal did have gas, however, they had no electricity to pump it with. Bring all you need. They sell 30 liter plastic gas jugs in Uyuni for 50 Bolivianos if you need to bring a bit more than usual with you. That said, it wasn’t as long of a drive as I had read in other blogs. We made it to the thermal springs easily before dumping in our cans and jugs (and we get pretty bad fuel economy). We arrived in San Pedro with well over half a tank left. You can buy water, candy bars, and beer at the thermal springs in a pinch. We did the easier of the tracks through the circuit. It involves hanging a left at Villa Alota with an immediate, fairly deep water crossing but easily manageable with a little speed. After that, there is a right hand turn that is the shorter way to the park entrance before Laguna Colorado. The roads were never bad in a four wheeling sense, but after San Cristobal there was almost constant, bad washboard and some spots with sand. Also, you’ll be driving to elevations upward of 16,500 feet where you’ll definitely lack normal engine power. DO NOT FORGET TO STOP AT ADUANAS 80KM PRIOR TO BORDER. You have to hand in your import papers for your vehicle there. Minutes away from La Paz and in the valley below Oberland (the popular overlander’s hangout) is Valle de Aranjuez. It is composed of about a dozen sectors spread out on both sides of the river. No need for gear, it’s only sport here including the cracks. The rock is… interesting. 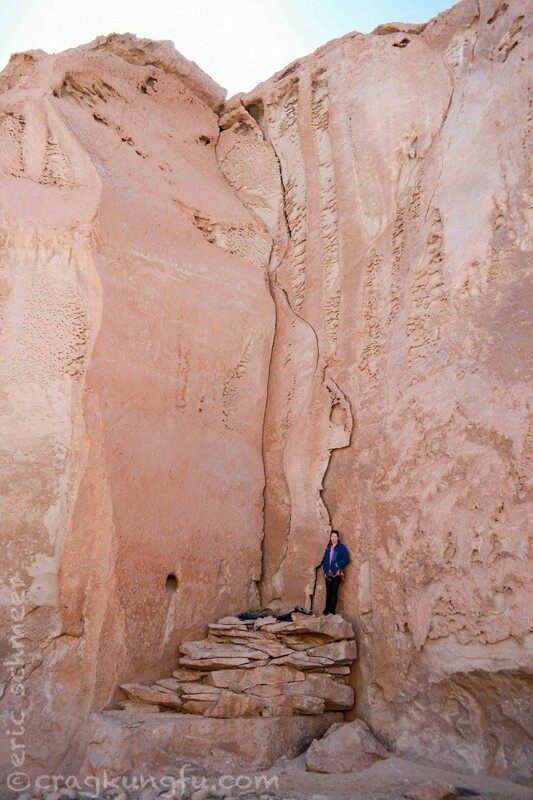 Lot’s of mediocre sandstone mixed with pretty smooth conglomerate. That said, there’s enough well equipped, thought provoking routes on good rock to keep you busy while you’re in the area. Also nice is the parking situation. There is a park stretching through the base of the valley that is quite safe for leaving a vehicle (or stealth camping). The approaches are short and the fins tend to have routes on each side which makes it easy to chase or dodge the sun. This is on the other side of the river from the road. We were rained/hailed off after only a few routes but we thought the side of the valley with the road had better rock, routes, and bolting. This is a good place to camp just South of Laguna Colorado. 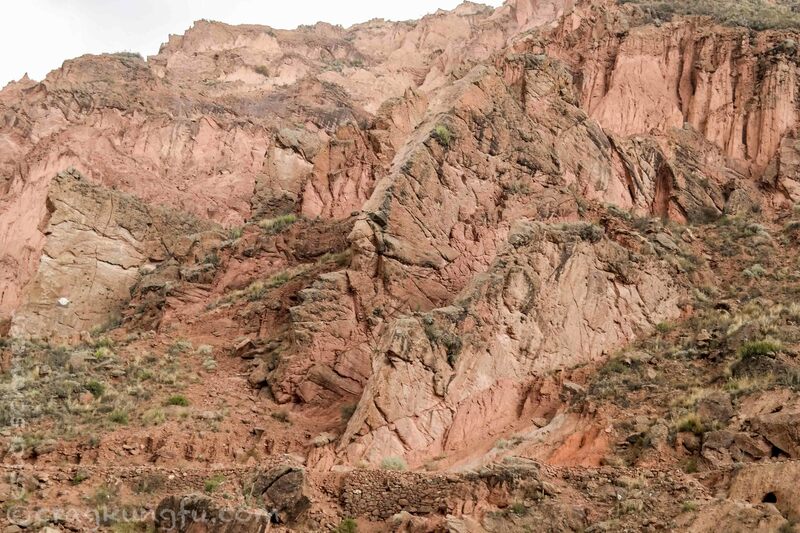 When we pulled into the canyon to camp we were amazed at the quality of the rock. There are endless lines to be done. Not the tallest, but high quality and SPLITTER! 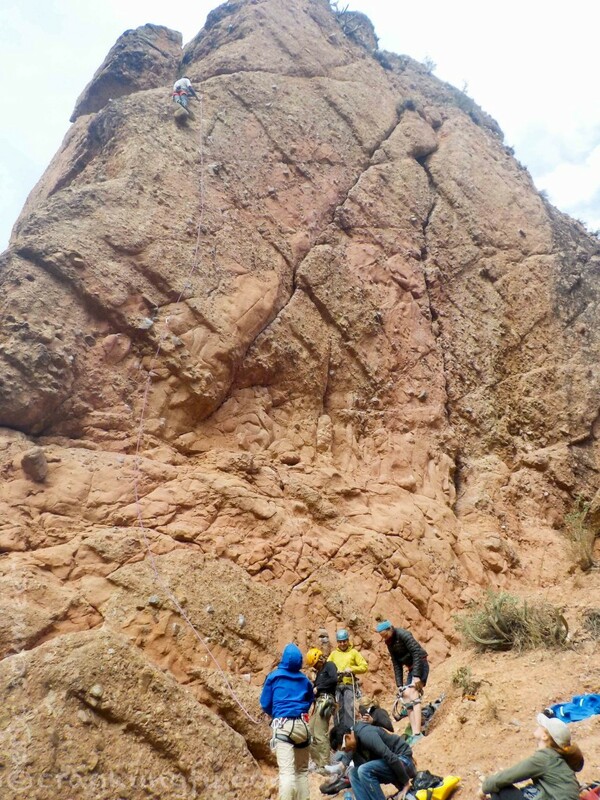 The most limiting factor that prevented us from doing more new routes was only having doubles with us. 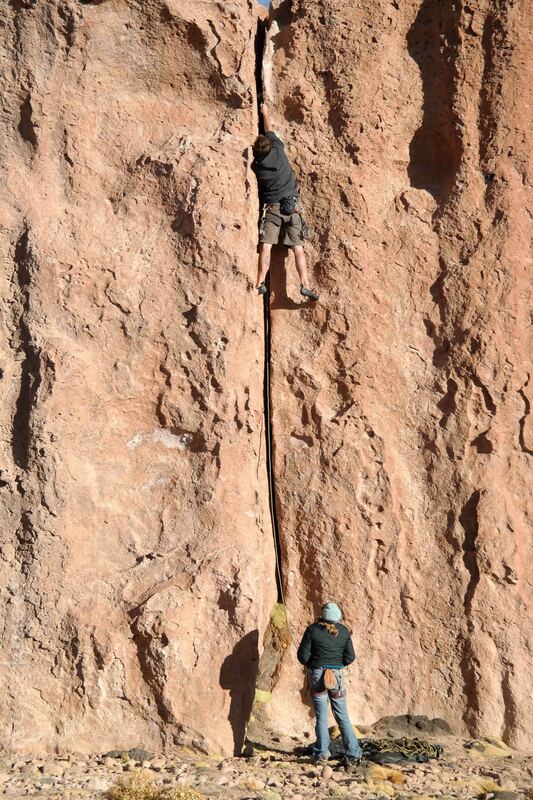 Having three, four, or more in whatever size you’d like to climb would go a long ways. 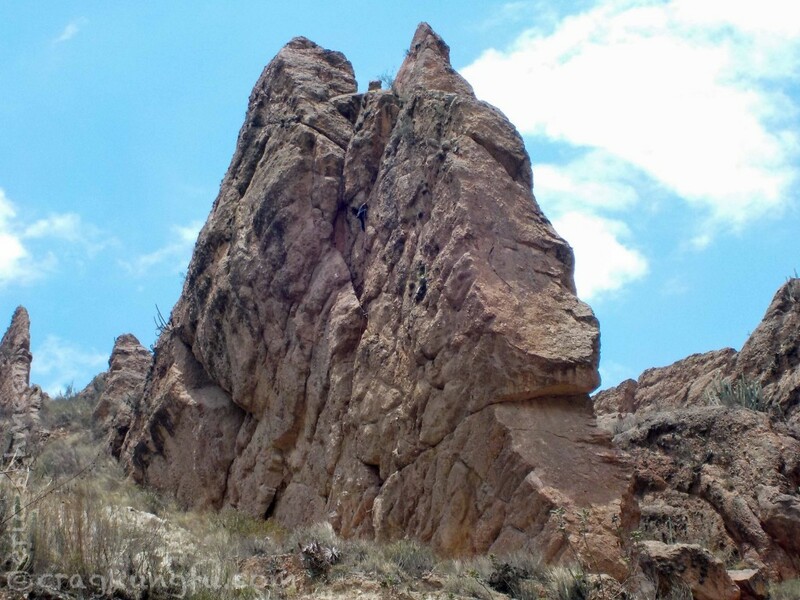 The rock is very good volcanic stone with some features to use outside of the cracks as well. Also, if you boulder, bring your pad – the bouldering potential here is probably better than the climbing, which is also excellent. You can do FAs for as long as your supplies last at 14,000+ feet!! !